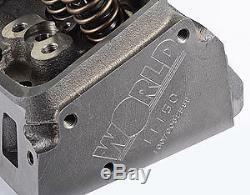 World Products 011150-1 Small Block Chevy Sportsman II Cast Iron Cylinder Head. Applications: World has tested Sportsman-II heads in many applications including 375Hp 9:1 street engines; 450HP 9.8:1 street /strip engines; all the way to 940HP blown alcohol drag race engines. Typical Application Street: 274 Cam: 230/236°. 490'', 750 cfm carb, 1-3/4'' header. 430HP on 9.8:1 355; 480HP on 383 10.5:1 (varies with displacement and compression ratio). Typical Application Drag Race: Modified 750 cfm carb, 276/284° roller cam, single plane plenum intake, 1-3/4''-plus header. 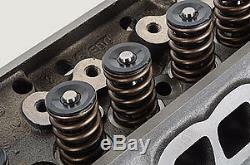 MUST Upgrade to 1.550'' roller valve springs and 10° hardware. Up to 650HP normally aspirated depending on displacement and CR and porting. Material: High density cast iron Valve Seats: Integral intake, hardened steel exhaust Valve Guides: Integral cast iron Valve Spring Seats: Machined for 1.250'' springs Valve Size: 2.020'' x 1.600'' Exhaust Flange: Stock locations, 7-bolt universal pattern. Included In Assembly: Erson stainless steel valves, ring and band-style seals, valve springs, Erson 7° chrome moly retainers, and keepers. 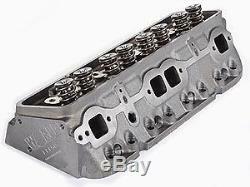 Head Gaskets: Fel-Pro #1003 (265-350) or equivalent Puhshrods: Requires heat-treated pushrods. Use of 1.6 ratio rocker arms require elongation of pushrod holes. 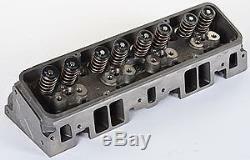 Screw-in Studs: 3/8" or 7/16" with 7/16"-14 base thread Pushrod Guidplates: Flat 5/16" Erson 601 or equivalent Spark Plugs: Accepts 14mm. 460'' reach tapered seat 5/8'' hex or equivalent Intake Gasket: Fel-Pro #1205 or equivalent Exhaust Gasket: Fel-Pro #1404 or equivalent. Maximum Valve Diameter: 2.100'' x 1.600'' or 2.080'' x 1.625'' Maximum Spring Seat Depth (from inside step). 030'' Maximum Spring Diameter: 1.550'' Approximate Milling Guidelines(varies with depth). 0065'' per cc Maximum Flat Mill Depth (up to intake seats). 040'' Maximum Angle Mill approx. NOTE:These specifications are for reference only. JEGS High Performance 101 Jeg's Place Delaware, Ohio 43015. 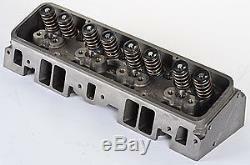 The item "World Products 011150-1 Small Block Chevy Sportsman II Cast Iron Cylinder Head" is in sale since Wednesday, March 26, 2014.